48 ins in diameter – 13 ozs. To get this measurement it is absolutely necessary to work at a tension to produce 7 stitches to the inch in width. 1st and 2nd rows: Knit plain. * * 3rd row: K4, turn. 4th row: Slip 1, K3. 6th row: Slip 1, K5. 8th row: Slip 1, K7. Continue working 2 more sts in every alt row until the row “Slip 1, K 117” has been worked. In next row: K4, * yo, k2tog, rep from * to end of row. Rep from * * to * * eleven times. Cast off loosely. ** 1st row: K4, (yo , k2tog, K1) twice (yo) twice (in following row each loop will be worked as a st, thus making 2 sts), k2tog, K18. 2nd row: K9, (K1, P1, K1) into next st, K9 (K1, P1) into (yo) twice of previous row, K3, yo, k2tog, K1, yo, k2tog, K2. 3rd row: K4, yo, k2tog, K1, yo, k2tog, K12, P3, K9. 4th row: K10, yo, K1, yo, K15, yo, k2tog, K1, yo, k2tog, K2. 5th row: K4, (yo, K2tog, K1) twice (yo) twice, k2tog (yo), twice, k2tog, K7, P5, K9. 6th row: K11, yo, K1, yo, K11, P1, K2, P1, K3, yo, k2tog, K1, yo, k2tog, K2. 7th row: K4, yo, k2tog, K1, yo, K2tog, K14, P7, K9. 8th row: K12, yo, K1, yo, K19, yo, k2tog, K1, yo, k2tog, K2. 9th row: K4, (yo, k2tog, K1) twice [(yo) twice, k2tog] three times, K7, P9, K9. 10th row: K13, yo, K1, yo, K13, (P1, K2) twice, P1, K3, yo, k2tog, K1, yo, k2tog, K2. 11th row: K4, yo, k2tog, K1, yo, k2tog, K17, P11, K9. 12th row: K14, yo, K1, yo, K24, yo, k2tog, K1, yo, k2tog, K2. 13th row: K4, (yo, k2tog, K1) twice [(yo) twice, k2tog] three times (yo) twice, slip 1, k2tog, psso, K7, P13, K9. 14th row: K9, slip 1, K1, psso, K9, k2tog, K9, (P1, K2) three times, P1, K3, yo, k2tog, K1, yo, k2tog, K2. 15th row: K4, yo, k2tog, K1, yo, k2tog, K20, P11, K9. 16th row: K9, slip 1, K1, psso, K7, k2tog, K22, yo, k2tog, K1, yo, k2tog, K2. 17th row: K4, (yo, k2tog, K1) twice [(yo) twice, k2tog] three times, (yo) twice, slip 1, k2tog, psso, (yo) twice, slip 1, k2tog, psso, K7, P9, K9. 18th row: K9, slip 1, K1, psso, K5, k2tog, K9, (P1, K2) four times, P1, K3, yo, k2tog, K1, yo, k2tog, K2. 19th row: K4, yo, k2tog, K1, yo, k2tog, K23, P7, K9. 20th row: K9, slip 1, K1, psso, K3, k2tog, K25, yo, k2tog, K1, yo, k2tog, K2. 21st row: K4, (yo, k2tog, K1) twice [(yo) twice, k2tog] three times [(yo) twice, slip 1, k2tog, psso] three times, K7, P5, K9. 22nd row: K9, slip 1, K1, psso, K1, k2tog, K9, (P1, K2) five times, P1, K3, yo, K2tog, K1, yo, k2tog, K2. 23rd row: K4, yo, k2tog, K1, yo, k2tog, K26, P3, K9. 24th row: K9, slip 1, k2tog, psso, K28, yo, k2tog, K1, yo, k2tog, K2. 25th row: K4, (yo, k2tog, K1) twice [(yo)twice, k2tog] three times [(yo) twice, slip 1, k2tog, psso] four times, K17. 26th row: K19, (P1, K2) six times, P1, K3, yo, k2tog, K1, yo, k2tog, K2. 27th row: K4, yo, k2tog, K1, yo, K2tog, K39. Rep. from ** to ** thirty-seven times. Cast off. Using a flat seam, sew centre seam, then thread wool round centre, draw up and fasten off securely. 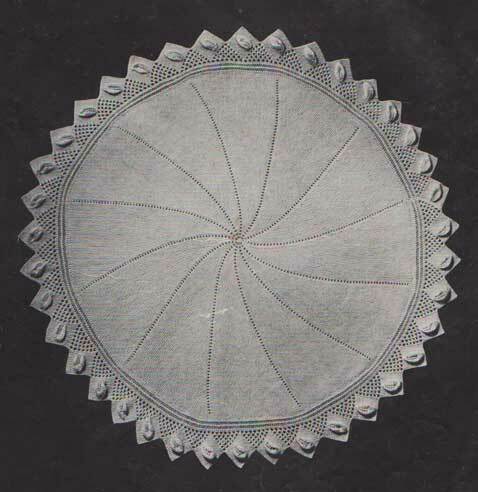 Sew seam of border, then sew evenly in position around centre. Finally, press all seams. The original publication of this pattern is in the public domain, however this digital copy is copyright Sarah Bradberry, May 24th 2012. All rights reserved.